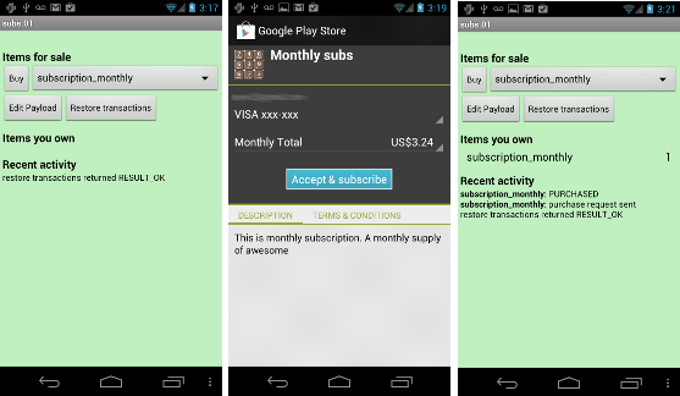 The Android Developers team has announced new "try-and-buy" in-app subscriptions are coming to Google Play. Starting today, developers can set up a trial period for subscriptions, where a user is charged a zero fee for the duration and the subscription is marked as paid until canceled or the trial period has finished. Users (that's you and me!) can cancel the subscription at any time during the trial, and when the trial period is over they will be charged through Google Wallet for the cost of the subscription. There are no big changes for developers, as the new methods use existing apk files and are all done server side. It's a little used feature for most of us, but hopefully these new tryout periods change that a little and developers have a way to offer quality content that we're all willing to pay for. I know I would be more apt to consider the subscribed content model if I has a trial period, what about you? Holler in the comments.